Send us original document and we'll get it apostilled and mailed back to you. Fast and reliable. Any U.S. state. A document intended for use in a foreign country has to be legalized and various seals and signatures are placed on the document in the process of chain authentication. If the target country has joined the Convention Abolishing the Requirement of Legalization for Foreign Public Documents ("The Hague Convention") the simplified procedure of standard authentication by Apostille certificate/seal is applied. (Apostille is a French word which means a certification). A document bearing an Apostille is valid in all of the Hague countries. United States has been a party to the 1961 Hague Convention since October 15, 1981. 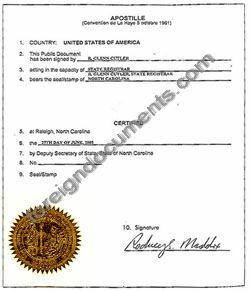 Documents notarized by a currently commissioned North Carolina Notary Public and authenticated by relevant North Carolina County Clerk or authorized Deputy County Clerk. Certified copies of Birth Certificates, Death Certificates or Marriage Certificates issued by North Carolina vital Records Office.